Will a green ball or red ball tumble down the wall? Has the The Wall TV show been cancelled or renewed for a second season on NBC? The television vulture is watching for the latest cancellation and renewal news, so this page is the place to track the status of The Wall season two. Bookmark it, or subscribe for the latest updates. Remember, the television vulture is watching your shows. Are you? 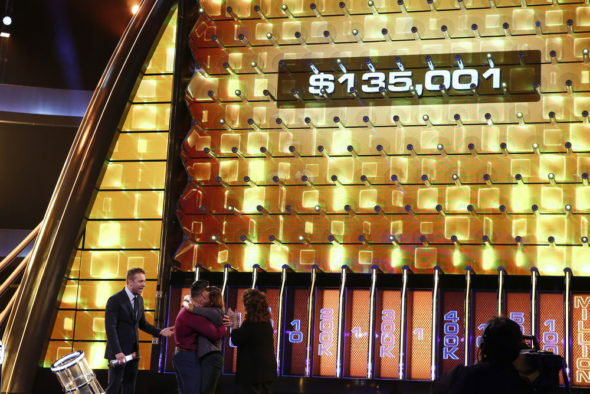 Chris Hardwick hosts this new game show airing on the NBC television network. The Wall follows pairs of players as they pursue a cash prize of up to $12 million. When a team answers a trivia question correctly, a green ball drops from the top of the grid-like wall and bounces randomly toward the bottom of the four-stories high structure. At the bottom of the wall, the ball will land in one of many slots, each with a value of $1 to $1 million. That value is added to the team’s total winnings. If the team misses a question, a red ball descends toward a random slot. The resulting amount will be deducted from the team’s total. In this game, players need both the answers, and lucky bounces, to win a big cash prize. The first season of The Wall averaged a 1.45 rating in the 18-49 demographic with 5.96 million viewers. Find out how The Wall stacks up against the other NBC TV shows. On January 18, 2017, The Wall was renewed for a second season. It debuted on June 22, 2017 at 8pm. Will it be cancelled or renewed for season three? NBC ordered 20 additional episodes of The Wall in January 2017. The initial season one episode order was for 10 episodes so, theoretically, the series has been renewed for at least season two. We’ll have to wait and see how the episodes are distributed. TV show ratings are still important. Follow The Wall’s weekly ups and downs. Find more The Wall TV series news or other NBC TV show news. What do you think? Are you a fan of The Wall TV show? Are you glad that NBC has renewed this game show for a second season? The Wall: Cancelled or Renewed for Season Three on NBC? We really like the Wall. There are so few good shows on tv these days and this is one of the best! Really liked the game show the Wall very pumped up and exciting show .realky would like to see it continue. I would like to see the show renewed. Awesome show. But those red balls are a killer. Please bring it back. Renew Renew Renew! I love it.. I loved this show it was a nail biting exciting show!! Keep it coming and the fact that someone like me can win some money too it’s awesome! !